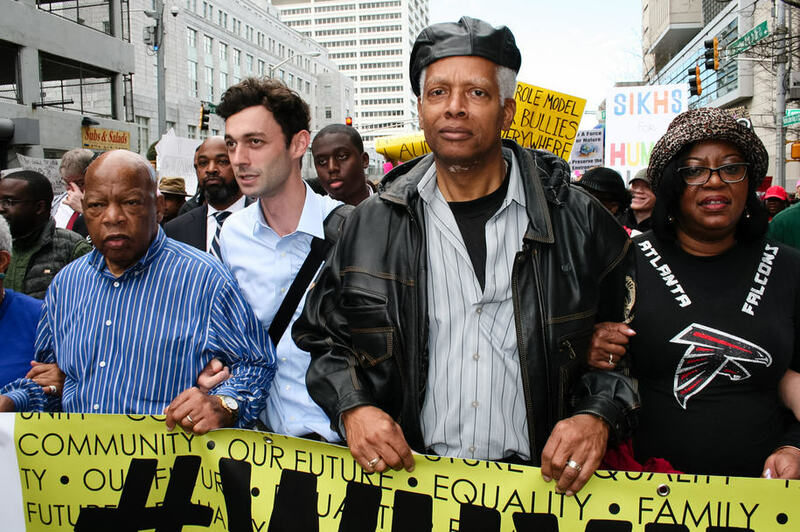 New Orleans Jon Ossoff, a 30-year old documentary filmmaker in Georgia and a former Congressional aide, took a run at winning an election in a suburban Atlanta district so conservative that it had not sent a Democrat to Congress since the days Jimmy Carter, 40 years ago. Ossoff was running as a Democrat to replace arch-conservative Congressman Tom Price, who is wrecking his special brand of havoc in Washington as Secretary of the Department of Health and Human Services. In the heavily funded and much watched primary as one of the early barometers of voters’ feelings about President Trump, Ossoff narrowly missed winning the election without a runoff, polling more than 46% against a field of Republicans and now headed for a runoff. Certainly, Ossoff’s victory is not assured in June in the runoff, but there is no doubt that this race, as well as a better than expected showing recently in a rock ribbed district in Kansas, narrowly won by a Republican, means that the lights have come on in Georgia, the White House, and everywhere else that Republican strategists and pollsters are burning the midnight oil trying to figure out what these early races could portend for continuing one-party control of Congress and the already tenuous Trump presidency. If nothing else, we are already seeing a financial arms race at work as Republican donors are having to recalculate the likely cost of defending what have been crimson solid Republican-base districts. Ossoff attracted more than $3 million dollars for his campaign, many multiples over the Republican field, but reportedly Republicans have also been forced to dig deep to stay in the battle. Are these early elections really barometers of opinion on Trump and his presidency? Yes and no. Off-year special elections are always more local than national with their own set of issues, so the results are not definitively about Trump. Saying that doesn’t change the fact that the White House and the Republican Party can’t be happy about any of this. The candidates are first time neophytes and they are running against Trump hard and polling with unexpected strength which will embolden others, including more seasoned political warriors. Furthermore, the lessons for incumbents watching these early contests doesn’t lead any of them to a conclusion that Trump has coattails that will help them win reelection in 2018 or that a warm embrace of the President is part of the path to power now. If there is no such thing as a safe harbor district, then the rats will be jumping off the ship in increasing numbers, and no matter what bragging might be done by the President, the American people will have trouble hearing him while staring at the huge L increasingly being tattooed on his forehead. At the point that Trump and his people can’t win for losing, it’s all over but the shouting. This entry was posted in Ideas and Issues and tagged Congressional Races, Georgia, Jon Ossoff, Trump Administration by Wade. Bookmark the permalink.